Whites Spectra Series Metal detectors – The Spectra Series metal detectors manufactured by White’s Electronics of Oregon are some of the highest grade metal detectors on the market. There are 3 main types of White’s metal detectors in the Spectra Series. What is the Spectra VX3 metal detector? 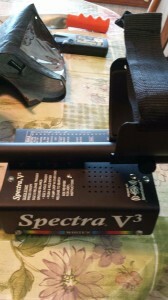 VX3 is closely related to the top-of-the-line White’s Spectra V3i Metal Detector. The new Spectra VX3 features have been carefully streamlined to use only what is required for top Spectra performance, an easy-to-tune and easy-to-use great performing metal detector. How do you adjust settings? Another easy feature! Every setting is on the live control bar ALL THE TIME! How easy is it to tune the Spectra VX3 metal detector? Right out of the box the VX3 has been set up to be easy to use and programmed for quiet and smooth operation. Settings are easy to understand and easy to modify for more aggressive operation. And, the VX3 has on on-board “Demo” program to show you just how easy this detector is to use. It’s a question Whites is happy to answer! 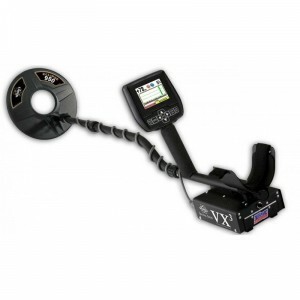 VX3 metal detector has everything needed to get top-of-the-line performance. “Head to Head” with the competition, you can be confident of VX3 depth and performance. The Spectra series is the result of years of research and development, time-proven manufacturing and testing techniques, and, most of all…listening to our customers. White’s premier headset lets you hear every signal with astonishing clarity and without worrying about distractions or tangled cords. Whites V3I with wireless phones, Great salt beach machine, retails for around $1800. 8AA batt pack, D2 coil. full color screen is scratch free, so many options for settings adjustment you can really tweak this for particular areas, everything works great. Three frequency mode or choose a single, one of the few detectors that function well in saltwater and beaches. factory reset code and owners manual inc.
NEW! Spectra V3i is White’s finest turn-on-and-go metal detector using 3 frequency detection to find the oldest, deepest treasures. HD color display, 10 Preset Hunting Programs, wireless program transfer, and much more. 10 All-New Turn-on-and-Go Hunting Programs: Set up by the experts at White’s. Choose from Coin, Coin and Jewelry, Salt Beach, Relic, Prospecting, Deep Silver, High Trash, Hi-Pro, Mixed Mode Pro, and Meteorite. It’s as easy as turning on your TV and choosing the program you want to see (and use). White’s Spectra V3i® features top-of-the-line performance with nine hunting programs that will have you hitting the mother lode of every major type of hidden treasure. High-resolution backlit full-color display allows you to easily see what’s hiding below and listen in on target acquisition. On-board quick-reference instructions at the flip of a switch for a fast how-to. Spectra’s 3×3 Quick Target Signature sorts out junk from the real deal. Automatic Ground Balance and Trac delivers simple, fast and accurate ground rejection. Choose language settings from Spanish, French, German, Russian, Turkish and English. 22.5KHz Rechargeable NiMH and eight AA batteries included. Made in USA. Adjustable length: 45.25″ – 52.5″. White’s New Spectra V3i with 8 Exciting, Completely Usable New Features! 1. On-Board Quick Reference Guide: Answers to almost any question with just a couple of keystrokes! Find cheap White Spectra metal detectors cheap!